This describes a PDX package exported using the current PDXpert release. Earlier releases may be different. Content topic numbers refer to the corresponding section in each IPC standard. As-built data is created by a downstream manufacturing process. These elements are not included in a PDXpert PDX package. IPC-2571 sections 2.4 and 3 refer to data compression using RFC 1952 V4.3 ("GZip"), which limits a compressed PDX package to 2GB (231 bytes). PDXpert releases 12.2 and earlier conform to this limit. For determining whether a PDXpert collection name or internal enumeration matches an IPC-2571 enumeration value, all whitespace is removed from both elements and the resulting values are compared (case-insensitive). If the computed values match, then the IPC-2571 enumeration is applied; otherwise Other is applied to the attribute value, and the original PDXpert value is applied to the attributeOther value. For example, after processing, PDXpert's BOM Type Codes collection member Direct material matches the PDX globalBillOfMaterialTypeCode enumeration DirectMaterial, so the latter is added to the package. However, Direct-Material does not match, so Other/Direct-Material is used. IPC-2578 separates parts into two categories: Items and ManufacturerParts. PDXpert follows this definition by exporting all items owned by the PDXpert home organization as Items; parts and documents are separated using the Item.itemClassification attribute. All partner items are exported as	ManufacturerParts; parts and documents are separated using the AdditionalAttribute itemClassification element. The IPC specification permits a BillOfMaterial list on an Item, but not on a ManufacturerPart. Therefore, if a partner part has a BOM, its PDX package includes the child components, but not the BOM structure (Find, quantity, RefDes, etc.). The home organization is always included as the first Contact (Organization) element in the Contacts group, even if it is otherwise not referenced within the PDX package. Except as noted, the order in which elements are added is undefined. The order in which attributes are added is also undefined, but the tables present their preferred order for readability in a PDX reader. The element topics are ordered alphabetically. An AdditionalAttribute describes one property's name and value within an AdditionalAttributes parent group. An AdditionalAttribute element is always optional, and is not written to the PDX package if the value isn't useful. Omit if a trimmed string is zero-length (for example, include Item element's globalTradeIdentificationNumber or notes only if the trimmed length is greater than zero. Omit if a numeric value is NULL. Numeric 0 values are useful and are always included. Omit if an item type has an optional attribute, such as an item's Auxiliary Person, and that option is disabled. Where there are separate PDXpert fields for an attribute value and its related unit of measure, these are combined into a single value/dimension pair. The content of each AdditionalAttribute element varies based on the containing element. Refer to the parent element of each AdditionalAttributes group for more information. AdditionalAttributes represent a named group used to describe optional element properties that are not defined within the IPC-2571 specification. Any number of groups can be created and labeled, and each group contains one or more AdditionalAttribute elements. This element identifies one item that's affected by a change, and contained within the AffectedItems list. Each element is added to the PDX package sorted by row number (rowNumber). itemUniqueIdentifier optional IDREF PUID that refers to the affected Item element. This element contains the complete list of items affected by a Change. This element identifies an alias contained within an item's AlternateIdentifiers collection. Not implemented in a current PDXpert release. This element contains all alternate identifiers associated with a particular item or part. A single item that's functionally equivalent to a BillOfMaterialItem. itemUniqueIdentifier required IDREF PUID that refers to the alternate Item element. This is the element that collects the set of functionally equivalent items for a specific BillOfMaterialItem. This element is the approved sources list for a specified part. This element describes a single approved source (manufacturer + part number) within the ApprovedManufacturerList. In PDXpert 10.0 and later, the user's organization and assigned role determines which manufacturer sources are included in the package. These elements are added to the PDX package sorted by Rank number (globalPreferredStatusCode). manufacturerPartUniqueIdentifier optional IDREF PUID that refers to the approved ManufacturerPart element. manufacturerContactUniqueIdentifier optional IDREF PUID that refers to the manufacturer's Contact (Organization) element. This element describes a single manufacturer part markup from a collection of ApprovedManufacturerListMarkups. This element points to a manufacturer part that will be, or has been, approved for use. This element points to a manufacturer part that will be, or has been, disapproved for use. This element collects the set of approved source markups for a specific AffectedItem. This element contains the list of all distributors, and their part numbers, for a manufacturer part. This element contains a single instance of a distributor and its part number for a manufacturer part. supplierPartUniqueIdentifier optional IDREF1 PUID that refers to the approved SupplierPart element. supplierPartContactUniqueIdentifier optional IDREF PUID that refers to the supplier's Contact (Organization) element. 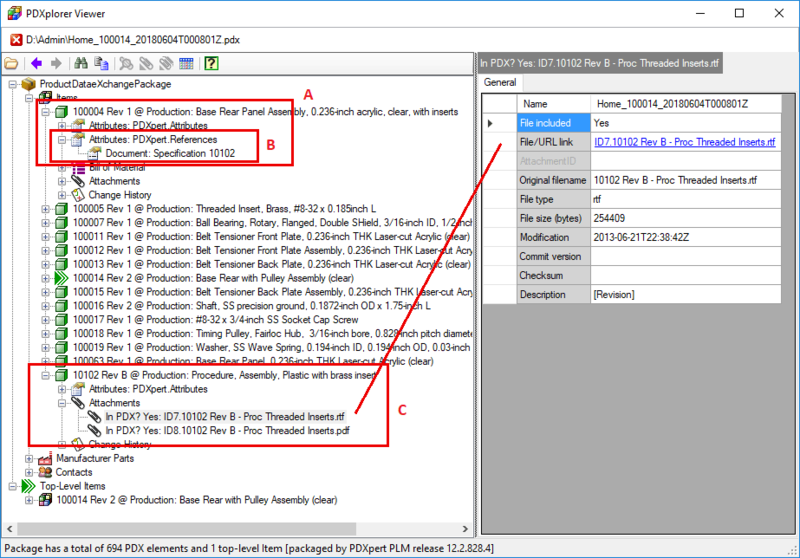 IPC-2578 calls for ID but the intent appears to be consistent with ApprovedManufacturerListItem / ManufacturerPart. If this is retained as an ID, then neither this attribute nor the SupplierPart element's supplierPartUniqueIdentifier has any defined use. This element identifies a change reviewer within a Change's list of Approvers. Each element is added to the PDX package sorted by approval sequence number (approvalSequence). approverContactUniqueIdentifier optional IDREF PUID that refers to the reviewer's Contact (Person) element. This element contains the set of all approvers for a single Change. This element describes a product produced in a specified quantity. This element describes one file contained within, or external to, the PDX package. Revision files and change form files are included (isFileIn="Yes") in the PDX package. Document and part item files are identified but not included (isFileIn="No"). Web links (URIs) are included but the URI objects are not. Item files are background or historical records such as proposals/sketches, budget spreadsheets, vendor quotes, customer emails, etc. These are rarely useful to the supply chain, and can substantially increase the PDX file size or compromise private information. Item-level attachments are identified in case the supply chain partner decides to inquire about a file that might be useful. This element describes a single file attachment markup within a collection of AttachmentMarkups. This element points to an added file attachment within a AttachmentMarkup. This element points to a removed file attachment within a AttachmentMarkup. This element collects the set of file attachments being changed on one AffectedItem. This element is a collection of one or more files attached to another object in the PDX package. This element contains the set of lower-level "child" component items within a higher-level "parent" assembly Item. Within an item's BillOfMaterial list, this element identifies the row that contains a unique child component item, with the quantity needed to make the parent item. Each element is added to the PDX package sorted by Find number (proprietarySequenceIdentifier). billOfMaterialItemUniqueIdentifier optional IDREF PUID that refers to the BOM row's Item element. Included when the component part's default unit of measure is permitted to be overridden with a compatible unit of measure on the BOM. This element describes a proposed child item change as part of a BillOfMaterialMarkups collection. This element points to a new "child" component item within a "parent" assembly BillOfMaterialMarkup. This element points to an old "child" component item within a "parent" assembly BillOfMaterialMarkup. This element contains each BoM markup within one AffectedItem. This is the element that describes a single change within the Changes collection. changeOwnerContactUniqueIdentifier optional IDREF PUID that refers the analyst's Contact (Person) element. changeOriginatedByContactUniqueIdentifier optional IDREF PUID that refers the originator's Contact (Person) element. As defined by the Custom property descriptor on the item type collection member. As entered on the item's Custom list. If custom attribute's Scheme is Collection, then apply the collection member's name; otherwise, apply the attribute value. If custom attribute's Scheme is UOM, then this is the unit of measure; if Scheme is Money, then this is the ISO currency code; otherwise empty. The PDXpert custom attribute's Scheme determines the IPC-2571 data type: UOM=Double; Boolean=Boolean; Date=DateTime; Float=Double; Integer=Decimal; Money=Decimal; String=String; URI=UriReference; Collection=String. This element contains a set of history records about one Item. This element identifies a specific change contained within the ChangeHistory set of all changes that have affected an item. This element lists each change within the PDX package. The Characteristics element is the set of all Item properties that are not otherwise defined within the IPC-2578 specification. This element identifies the configuration of a particular ProductInstance. This element describes one contact within a collection of Contacts. Contact elements have a dual role in IPC-2571: as a human (PDXpert Persons) and as a legal entity (PDXpert Organizations). To support these separate roles, PDXpert (and many other PDX generators) broadly define Contact attributes like contactName. This element identifies a set of roles within a larger collection of ContactRoles. This element identifies a set of roles for a particular Contact. This element is the list of all person & organization contacts within the PDX package. This element describes an enumerated characteristic (with source of the permitted enumerations) of an item's Characteristics collection. This element identifies one role from a set defined by a ContactRole collection. This element is a collection of one or more history items that trace user actions affecting PLM objects. This element describes one history item (an action taken by a user at a point in time) within a collection of HistoryItems. userContactUniqueIdentifier optional IDREF PUID that refers the user's Contact (Person) element. This element identifies a unique home organization part or document within the PDX package's Items collection. ownerContactUniqueIdentifier optional IDREF PUID that refers to the trustee's Contact (Person) element. The item's Part Types or Document Types member name. Part or document Number value. The IPC-2571 standard does not explicitly define References. PDXpert uses the AdditionalAttributes element to include a referenced item, which is added to the Items list. That item includes the referenced item's attributes; attachments for revision (isFileIn=Yes) and item (isFileIn=No) files; materials; and change history. The PDX specification's AdditionalAttributes element doesn't support a recursive structure, and therefore a PDX package excludes the referenced item's own references, sources and BOM items. If your supply chain partner needs these details, the referenced item must be exported in its own PDX package. In PDXpert 10.0 and later, the user's organization and assigned role determines which references are included in the package. Part 100004 Rev 1 has a reference within the PDXpert.References list. The PDXpert.References list contains a Specification 10102. The Specification 10102 Rev B is listed with other items. It has two file attachments. This element contains the list of all "home" physical part and document elements within the PDX package. It excludes partner items. This element identifies the manufactured lot (batch) for a particular ProductInstance. This element identifies one partner organization part or document within the PDX package's ManufacturerParts list. manufacturerContactUniqueIdentifier optional IDREF PUID that refers the manufacturer's Contact (Organization) element. ownerContactUniqueIdentifier optional IDREF PUID that refers the trustee's Contact (Person) element. The IPC-2571 standard does not define References, and a PDX package has limited support for referenced items. An item that's included in the PDX package only because it's referenced by another item will be included in the Items list. That element includes the item's attributes; attachments for revision (isFileIn=Yes) and item (isFileIn=No) files; materials; and change history. The PDX package does not include the referenced item's own references, sources or BOM items. If your supply chain partner needs these revision-level lists, the referenced item must be exported in its own PDX package. This element contains the list of all manufacturer ("partner") parts contained in the PDX package. This element describes a measurable or measured characteristic (with tolerance) of an item's Characteristics collection. This element identifies the packaging container (carton and/or pallet) for a particular ProductInstance. This element identifies one process step for producing a particular ProductInstance. This element is the root XML node for all other PDX package elements and attributes. This element describes a single production unit within an AsBuiltProduct collection. itemUniqueIdentifier optional IDREF PUID that refers to the product instance's Item element. This element specifies the digital security certificate for a particular Contact. This element describes a ranged characteristic (with upper and lower values, as well as tolerance) of an item's Characteristics collection. This element identifies a single reference to a BillOfMaterialItem component within the ReferenceDesignators collection. The rules for identifying quantity and format errors in PDXpert's BOM Markup RefDes field are used to create these elements. If the BOM row has an incorrect number of RefDes or contains format errors, the number of ReferenceDesignator elements may not match the BillOfMaterialItem row's itemQuantity value. This element contains the set of reference designators for a specific BillOfMaterialItem. Typically the number of ReferenceDesignator elements in the set is equal to the BillOfMaterialItem's quantity value. This element identifies a single serial number within the SerialNumbers collection. This element identifies a set of sequentially-serialized items within the SerialNumbers collection. This element contains the set of serial numbers for instances of an Item or a BillOfMaterialItem. This element describes one distributor/supplier part within the SupplierParts collection. supplierContactUniqueIdentifier optional IDREF PUID that refers the supplier's Contact (Organization) element. description optional String ManufacturerPart part name. ownerName optional String ManufacturerPart trustee name. ownerContactUniqueIdentifier optional IDREF PUID that refers to the ManufacturerPart trustee's Contact (Person) element. This element contains the list of all supplier parts. This element describes a text characteristic (with source of the allowed textual values) of an item's Characteristics collection. This element identifies the work order authorizing a particular ProductInstance.